@Stefan - Before we continue, I dont want you to feel personally offended by my comments. I love these kinds of discussions, and the last thing I want is to piss anyone off. So if my comments offended you, I take them back. Im sorry, the but the HTC One X and One S comparison is a pretty lame example. They are 2 separate products..the Padfone is one product, but is often (not always, but often) shown and marketed as 2 products. Even with a phone and display, its ONE product, not 2. And I dont see how Im dodging any question here. For me personally, it would make ALOT more sense to have a tablet, a REAL TABLET with a port that my phone, a REAL SEPARATELY OPERATING PHONE, could connect to for file exchange or tethering, or to get really crazy...a power boost for running games or graphic heavy applications! THAT would make sense to me personally, and would justify the price ALOT more. That article shows the device up for preorder NOW for 980 US dollars. Price is set, point is made. And if you think that in the States and EU the prices will be 300 and 400 dollars different, they won't. Performance wise, I DO berate the Padfone, as its a DUAL core device being sold for a QUAD core price. Im not talking quality..Im talking price. You got each and every point wrong. As to the "deception" of Asus, I can play stupid as well and say "I bought a One S, where is my free One X? HTC ALWAYS displayed them next to each other". When people didn't get that the Padfone is one device with special accessories, it's because they don't think. And that is a proven fact. There are hardly any marketing shots of blank screened tablets, they always show bright colorful scenarios - why should Asus do otherwise? It all comes down to my question, which you were just dodging: what sense would a fully-fledged tablet with a phone hatch make? OK, talking about the price. To give this discussion a bit more sense, let's just stay on one continent. I fully expect the Padfone to cost €500, just like the HTC One S with much the same specs. And I expect it to cost €700 including the Station, maybe even skipping the standalone phone altogether. The Transformer keyboard docks have always cost around €150 by themselves, €100 bundled. I really hope they make a €800 package with phone, station and keyboard. I don't know what they will charge for the headset stylus, so I will just leave that out. On the other side you could buy a One S and a Transformer 300, which will soon be available for €500 with keyboard, €400 without. So you save €200 and the battery munching that comes with tethering your tablet to the phone (as it is WiFi only). For me, it is still interesting, but not if my prices are off by far. Also I would need to check for special offers - for example I could get a HTC One S cheaper than a Galaxy S 2 with a certain attractive contract. You always got to calculate the total costs of ownership and usage for two years. And as the prices are not yet set, you have PROVEN nothing. With the performance: just keep counting your cores, it's all right. I prefer counting FPS and enjoying a dual channel memory setup. What the point of Tegra 3 is in the article? Well, the point that you berated the Padfone for not having one. As I said, wait for side by side comparison of the two HTC One X, as everything besides the chipset is identical. Then we can take a look at the numbers, not the least among them the battery life. Where I must really wonder if you even read my post is the part were you felt like chuckling at me. I was asking you were the benefit of your proposed device with Padfone-style docking but standalone tablet unit over a regular phone and tablet were (see my question above, again). But if you find it such a big deal to save phone battery while using the tablet: with the Padfone, it is not only not getting drained, it is getting charged while using the tablet! Alright guys, take a chill pill. I believe that each of us have valid points in all that we have stated thus far. I agree that since the Padfone is one device, it definitely should have one price for the tablet and the phone. The extra tablet docking station can be priced differently, sure. At $600USD, it is definitely a very expensive phone, considering that even the iPhone 4S is also priced at $399USD for the highest capacity option. But if you do wish to compare a quad core tablet and a dual core phone option as you have @Eric, you'd need to subtract off the price of the docking station. In that case, for a tablet and the phone from Asus, it will be a rough total of $860USD which is subsequently $149USD more affordable than the option you mentioned. As far as pricing, the fact of the matter is that if it's around 1000 USD in the States, it will be MUCH more in the rest of world, especially Europe. My Galaxy Tab 10.1 debuted at 499 dollars in the US. Here in Germany, it costed me 650 Euros. International pricing has nothing to do with the point of the article, which is for that money, I have PROVEN to you that you could have much better choices instead of a dual core phone from a company that doesnt make phones. Fell for Nvidia marketing? Really? I guess thats why I havent sold my Tab 10.1 and bought a Prime right? As far as quad core goes, Huwaei's new quad core processor might just smoke Samsungs in benchmarks (doubt it, but possible). Again, what does Tegra 3 have to do with the point of the article? Am I wrong in assuming that most consumers would prefer having a Tegra 3 (lets face it, its the only choice right now until Samsung and Huwaei bring out their tablets) tablet along with a dual core phone for the same price they could purchase a dual core phone for? Common. As far as benefits go, I have to honestly chuckle a bit if you cant see those. I can use my tablet when I travel to play games without worrying about my phone battery draining. Its just common sense that its an advantage of being able to use them seperately. If its really a feature that its actually just one device, it should be PRICED accordingly. The Padfone concept only works if the pricing is way, WAY cheaper than the reported price. Its a year too late. An all in one device should come with all in one price, and not with the pricetag of 2 supposed devices that in reality are only 1 mid range device. Again, if you wish to throw a grand, or even 600 dollars at a dual core phone that can in some way act as a tablet, be my guest! I for one (as most readers here) would prefer spending the same money and getting not only double the hardware, but more than triple the power. 1. I really can't grasp why anyone didn't get the point that you can't use the station as a stand-alone tablet. It is the whole point of the concept. What sense would it make to insert a phone in a full grown tablet? To add weight as an oversized USB stick? 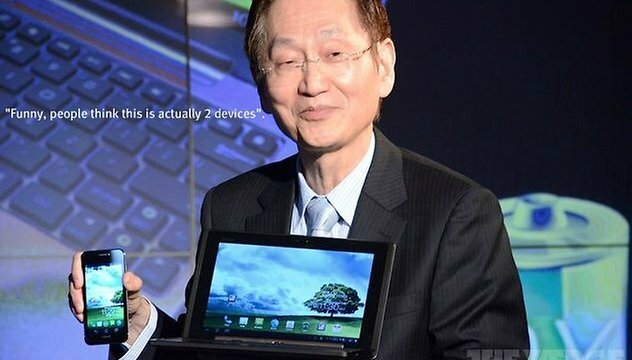 Asus never made any attempt to trick anyone into thinking this nonsense. Just because they showed off the phone besides a station with phone inserted? They just wanted to show you both modes side by side for comparison. And they demonstrated the process of inserting and ejecting the phone a bazillion times! 2. You widly mix up international pricing across multiple continents and compare them. Are you just pretending or did you really never notice that pricing can differ a lot from simple currency exchange? There are so many factors into this (like tax is out of US prices but always included in Europe). Before you get angry about the price, wait for it to be known. 3. You fell for NVidia marketing. The Snapdragon S4 is a lot faster than the S3 and beats Tegra 3 in most calculation scenarios and especially the graphics department. Now that the AT&T variant of the HTC One X is starting to get reviews, we will have a perfect comparison between the two chipsets soon. But keep in mind: Android benchmarks never were very reliable and they are becoming obsolete fast with newer chipsets hitting the 60 fps limit in many GPU tests. Please think about your proposed concept of fully fledged phone and fully fledged tablet with "the same concept as the Padfone" and tell me: what would be the benefits over regular phone and tablet? I can't think of any worthwhile. For charging, better pack a dedicated charger. For the screen, why not just use the tablet as it is? For the data, you would have a lot of sync options. Padfone makes sense (at the right price), your idea doesn't. EDIT: I read the Anandtech report again and maybe I am wrong in the graphics department in more modern, shader heavy scenarios, where the Tegra 3 seems to have the upper hand, as the Adreno 225 is based on an older design (it is still faster in other tests). But Tegra 3 never puts S4 leaps and bounds behind, in any scenario. Thanks for reading guys! @Zack: You made some very good points here as well. In terms of data plans for seperate devices, yes that is true. However, in my eyes it simply doesnt justify the excess cost. The stylus as well will most likely only be used by people who have a specific reason for using it (for drawing, editing, ect) and most likely wont be used too often by the masses. And you really hit it on the head with timing. A year ago, this could have been a game changer. Now, its just an overpriced gimmick that only tech conscious consumers might purchase. @Barry - If the fact that its one device should be the advantage, it should be PRICED as if its one device, and thats a big issue I have with the Padfone. Remember, we also have to think about this from a consumer standpoint. If you ask 9 out of 10 consumers if they would rather have 1 Xbox for X price or 2 Xboxes for the SAME price, Im sure you would agree that most would pick 2. Sure there might be some additional costs (extra data plan =extra tv/higher electric consumption, 2nd TV, ect), but most consumers are out to get the most for their money. To make it clear, MOST consumers would rather have a quad core tablet AND a dual core phone for 1000 vs a dual core phone that can act as the brain of a tablet for 1000. Its the pricing thats the main issue, not the concept. Concept wise, I like the idea. But the way its being marketed (as 2 devices when its actually only 1) and priced dont justify what your actually getting for your money. And I agree with you on Samsung. Im hoping they turn a lot of heads with a very high end quad core device in the next months with a realistic price tag. Eric I think you're missing the point: that fact that it's one device is actually the advantage. I used to have two computers: a powerful desktop that I kept at the office and a decent laptop I used at home. After a few years of this arrangement I got sick of constantly syncing and managing two computers, so I bought a high-end laptop and a docking station. Now I have the best of both worlds and only one computer to manage. I will never buy another desktop computer again. The way I see it, the Padfone is the phone/tablet equivalent of my laptop/desktop solution. You made very good points in the above analysis of the Asus padfone. I, for one, realized after several researches on the Padfone itself. At 610, it definitely is a very expensive phone with no unique features. I also managed to research that the tablet is useless without the phone as the phone acts as the brain of the whole device. However, despite your point above, you failed to take note the cost of having 2 data plans for both the HTC and the other tablet. I know that there are other ways to share the data plan by obtaining 2 SIM cards from your Telco. But that option increases the security risk. Once one of your 2 mobile devices is stolen, your data plan is compromised as the thief would have access to you mobile number and is free to make any number of calls they want, be it local or international. Furthermore, having 2 different mobile devices with different storages, indicates that you will have trouble transferring information/pictures/video from one device to another. I do not mean significant trouble, but just a greater inconvenience which Asus is trying to eliminate. Another point to note is the charging function of the Padfone. With so many applications, games and the use of 3G technology, phones nowadays have such a short battery life. What Asus is providing is the convenience of having a charging station with a larger display screen. 5x with the tablet, 9x with the docking station. Last but not least, they provide the bluetooth stylus handset as well, which is a great idea as shown in their commercial of the girl "Jessie". Able to conveniently pick up a call whilst using the tablet function. I believe that this bluetooth handset is not commonly available as well. I agree with the many points that you made especially the one about the tablet not being able to function without the use of the phone. I believe that not many people realized that; particularly the price of the tablet being set at only $250USD. Furthermore, the lack of a quad core processor does seem lacking despite many companies launching their new phones with that feature. The only drawback I have with it is that Asus took too long to launch this product. Should they have launched it last year in September 2011, it would be a revolutionary device, unique and in-sync with the current technology. Should they have launched it in February 2012, it would have still made the cut off. But launching it in late April 2012 has caused it to fall very much behind. But all in all, as a techie, I do like the concept of the Asus padfone. And since my phone plan is expiring soon, I have the intention of getting this new piece of technology.